and wondered if anyone would be interested? I was recently very blessed to stumble across a vintage quilt. I so wished that we could all have one just like it! it would mean we would be all well on the way to creating a quilt like this of our very own. that way I can judge if its a worthwhile idea or not. the squares would be 6" x 6"
they could be any colour or pattern.....in fact that's the beauty of it....its a totally eclectic mix. They would need to be vintage fabric......and in good condition. You send me as many as you wish....and you receive that amount back. and fire away with any questions too. 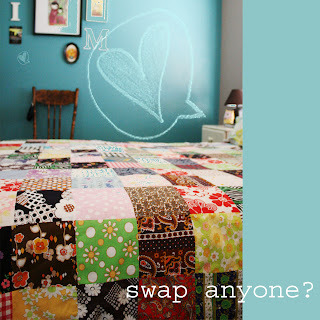 LOL - can YOU come with the swap and teach me to sew a quilt????? What a wonderful idea Mardi! I'd so love to join in but I don't think I have any vintage fabric in my fabric stash. :( Looking forward to seeing everyone's quilts though! I would love to be counted in but Im in the US, could I still participate? hey Mardi! i immediately thought of your quilt when i saw this...The Flea Market Find of the Year competiton!